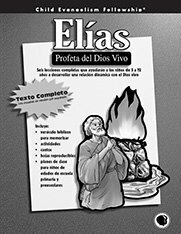 Spanish lesson text for six lessons on the life of Elisha. Lesson outlines, detailed story line, review questions, reproducibles and more. Lesson outlines, detailed story line, review questions, and more. Lesson 1 - Moses is Born (Exodus 1:1-2:10). Memory Verse: 1 Peter 5:7. Lesson 2 - God Calls Moses (Exodus 2:11-4:18). Memory Verse: 1 Thess. 5:24. Lesson 3 - Moses Delivers God's Message (Exodus 4:19-21; 276:9). Memory Verse: Prov. 3:5-6. Lesson 4 - Moses Sees God's Power (Exodus 7:1;12:42). Memory Verse: Ephesians 2:13. Lesson 5 - Moses and the People Cross the Red Sea (Exodus 13:1715:21). Memory Verse: Romans 8:28. Lesson 6 - The People Complain (Exodus 15:2216:36). Memory Verse: Phil. 2:14. 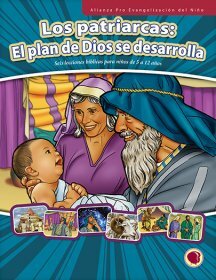 Spanish teacher text for God's Power: Escape from Egypt. 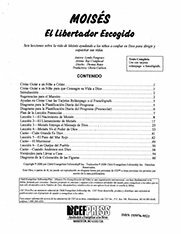 Spanish lesson text for the six lessons about David in God: The One Who Knows My Heart. 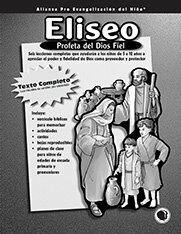 Text includes lesson outlines, detailed story line, review questions, memory verse teaching and more! 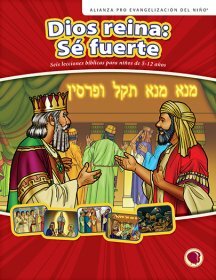 Spanish lesson text for six lessons on God Rules: Be Strong (life of Daniel). 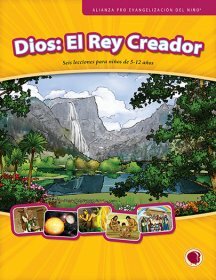 Includes lesson outlines, detailed story line, memory verse teaching, review questions and more!